The ICL900 by Delta-Q (Taiwan) is a 900-W charger suitable for use on scooters, floor care machines, lift trucks, and sports, and utility vehicles. The recently introduced product is designed to charge batteries with lithium-ion chemistry from 9 cells to 15 cells in series. “We are pleased to announce the expansion of our lithium charging line. Our products are designed to meet the evolving needs of our customers while providing reliability and long-term performance. The ICL900 is a perfect complement to our OEM customers as they incorporate lithium technologies into their products” says Trent Punnett from Delta-Q. 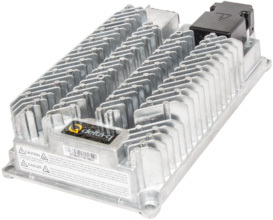 The device features a maximum output voltage of 57 V. It provides custom lithium algorithms to optimize battery performance and life to meet tough application requirements. The ICL900 features CAN connectivity communications. The ICL900 carries a set of regulatory approvals including touch-safe requirements for the European electric vehicle market. Featuring a wide AC input range the charger can operate on any single-phase electrical grid around the world. With a customizable, field replaceable cable design, the product provides original equipment manufacturers. Its mechanical design and component selection resists vibration, shock, and temperature extremes.